Marine water heaters are the electrical or propane-powered heating appliances that are used in the boating industry for space and hot water heating and where the shower, washing-up, and personal hygiene are the main applications. Check out the buying tips and most popular brands and models used in North America. These boat heaters provide an instant and sufficient amount of hot water using electricity, propane gas, or the engine's wasted heat energy, resulting in great benefits for the users. Marine hot water heaters are designed small and lightweight, installed mainly in the engine room and restricted areas. As they are made of high-quality materials, they can work in the harsh and very humid environment - subjected to fresh and salt aggressive water conditions. Most of the manufacturers design water heaters for boats and yachts with a corrosion resistant casing like stainless steel or aluminum and stainless steel or metal storage tanks (with protection). 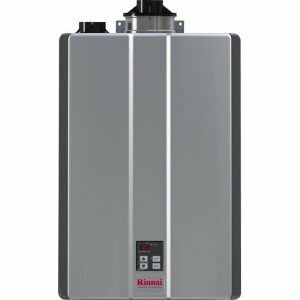 The most available tank sizes for most marine water heaters are in the range from 6 gallons, as the most common size, up to 20-gallon. The electric unit utilizes the immersion heaters that are usually positioned in the lowest part of the tank where the water is the coldest and where the unit can get the maximum from the heating element. Special attention is also given to the water inlets and outlets for a minimal mixing of cold water into the hot. Most heating elements work on 110 V when hooked to the shore power. Propane hot water heaters are specially constructed for the marine environment, with no electricity needed and depending on the engine's performance only. With the closed combustion, they are reliable units that can be mounted almost anywhere inside the boat. The thermostat has to be factory calibrated, and Coast Guard approved (UL) for spark ignition protection. 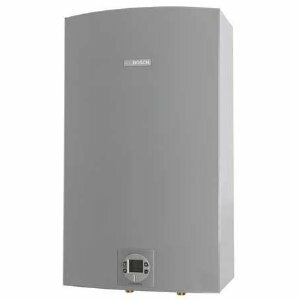 An Atwood marine water heater is a reliable and efficient electric heating unit, equipped with the high quality 1.4 kW and 1.5 kW Incoloy heating elements. The heating elements are designed to provide hot water quickly and withstand accidental operation when the tank is empty, usually fatal for copper heating elements. Designed as the lightweight heater, Atwood has a casing made of the high-corrosion resistant aluminum, so that it can work in the corrosive marine environment. Only two models; EHM6 SST with the 6-gallon tank size and EHM11 SST with the 10.5-gallon tank size have casings built from the stainless steel. Specialized aluminum alloys are also used for tanks, providing an extended tank life while reducing the total weight which is essential for boat construction. Superior heat exchangers use double tube construction, which prevents any possibility of engine coolant to contaminate the fresh water system that is running through. 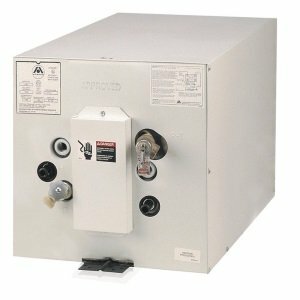 The Torrid marine water heater provides a 5-year warranty against tank failure, backed-up by 2 protective elements against corrosion; heavy-duty glass lining and oversized magnesium anode rod. Torrid boat heaters, with these two protective elements and safety thermostat cut-off, are constructed to last longer and easily work in the high-temperature environment. High-density fiberglass insulation keeps the hot water longer in the tank and increases the hot water usage. Super efficient heat exchanger, made of the high-quality copper with a silicon bronze casting and 1.5 kW stainless steel sheathed heating element will provide great 15 gallons per hour recovery with 40 F rise. Superstor marine water heaters are high-efficiency units consisted of the high efficiency extended surface heat exchanger with the finned tube, stainless steel corrosion resistant storage tank, and 1.5 kW heating elements for longer performance life and dock-side power use. The 2-inch, CFC-free, water-blown foam insulation is environmentally safe and used to protect the unit from energy waste and to reduce the heat loss. You can choose models with 6, 12 and 20-gallon capacity and recovery rate from 22 to 39 GPH with the delivery of 155 F. All models come with the 5-year warranty. Isotemp hot marine water heaters can be found in three different groups, based on the shape and diameter; Basic with 6.3 to 19.7-gallon tank size and Slim with 4,5 and 6-gallon capacity, both cylindrical in shape. Either installed horizontally or vertically great performance and fast hot water delivery is achieved in both positions. 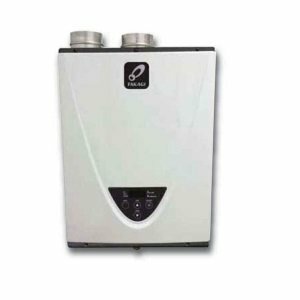 The Slim Square with 4.2-gallon tank size is another model from the Isotemp manufacturer that provides easy installation in three different positions, in narrow and limited space where the Basic and Slim are not viable solutions. High-quality material like stainless steel is not used only for casing, but for the tank, tubes, and all elements that are in direct contact with water. It uses heat from the engine coolant system and a standard 750 W or 1.2 kW immersion heating element. Isotemp Basic models 6403 D and 6753 D models have a dual heat exchanger for even better performance. All models come with a 5-year limited warranty. Webasto water heaters for boats and yachts, offers four types of marine heaters, for space and water heating. Install a unit per local codes. Install a shut-off valve and drain valve. Locate the heater near a floor for easy draining and flushing. Protect the unit from freezing temperatures. To connect heater use unions for plumbing. Always vent air from the heater. The tank must be full of water before the power is turned on. Flush water from the tank every other month to get rid of the sediments.